This article provides in-depth fundamental analysis of Nandan Denim Ltd, one of the world’s leading manufacturers of denim cloth with the largest manufacturing capacity in India. 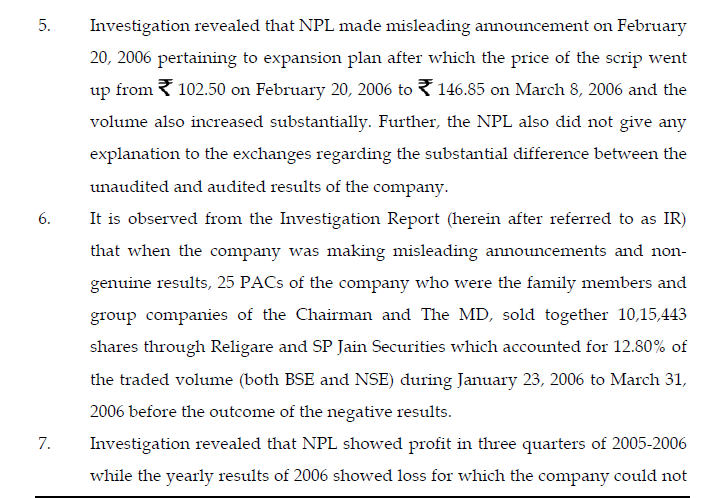 I’ve come across a company called Nandan Denim Ltd and have done its financial and other analysis as suggested by you. I’m attaching the financials for the company for your reference. Also, giving my analysis of the company. 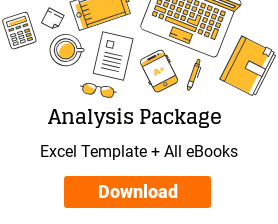 I would be grateful if you could spare some time to have a look at my analysis and let me know your thoughts on the same. Nandan Denim Ltd has seen a handsome sales growth in the last 10 years period. 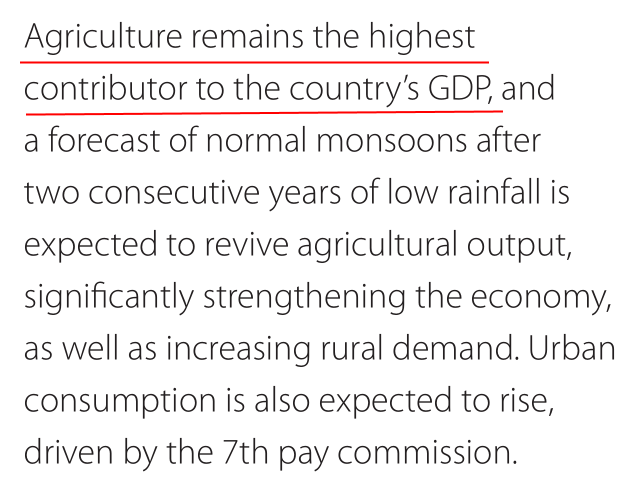 It has grown at a CAGR of 20% in the last 10 year period. There have been ups and downs, where the sales growth has declined, but it has never declined below 10% with an exception of FY 16 where the sales growth declined to 5%. However, this trend is likely to continue in 2017 as well, as the sales growth in the first 9 months stands at -3% (full year results are awaited as of 13th May when I’m writing this report). 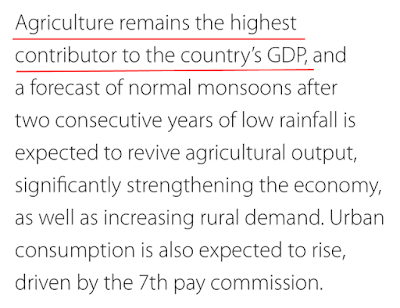 So we need to watch out if this trend is due to capacity issues, industry issues or company issues. NPM of Nandan Denim Ltd declined from 5.1% in FY’ 07 to -0.4% in FY’09. However, post this there has been a steady increase in profitability of the company till FY’16. The current NPM stands at 5.5%, which is up from 3.3% in the FY’12. Need to note is that Nandan Denim Ltd has been under various capex investments in the past, and the NPM has fluctuated, but due to these (depreciation and interest changing). However, over the last few years, the organization has managed to keep a constant depreciation and interest expenses. the organization has been paying their taxes diligently, indicating a good governance. The taxes have been within range, and not abnormally low over the years. Nandan Denim Ltd has maintained a high-interest coverage ratio over the last many years. Further, they have steadily increased their interest-coverage ratio over the last 5 years. This means they should be able to serve the debt very easily in times of difficulty. Debt – Equity ratio is higher than 1. Nandan Denim Ltd has gone in various capex investments from time to time, and this has led to high debt. However, there has been a constant effort to reduce the D/E ratio, and this has shown results as well. D/E ratio has come down from 2.2 to 1.7 over the last 4 years. The total debt for Nandan Denim Ltd stands at 530 cr, which looks reasonably high. The company has managed to reduce its cost of borrowing over last year. Further, they seem to be paying their interest regularly (also seen from their credit report). 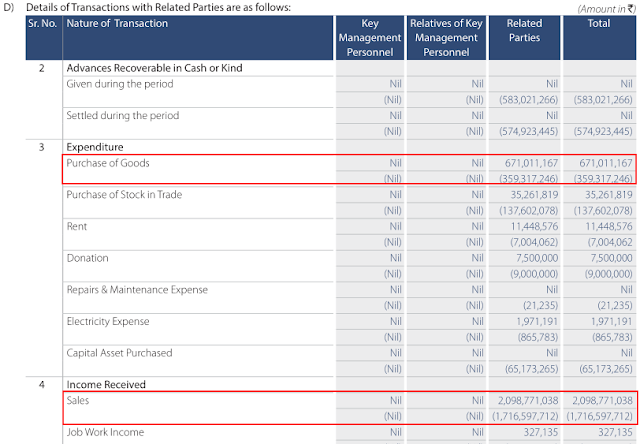 Nandan Denim Ltd has been maintaining current assets more than current liabilities, with a ratio > 1.3. They will be able to take care of current liabilities very easily. Nandan Denim Ltd has shown a steady increase in its cash flow over the last 10 years. Nandan Denim Ltd hasn’t generated enough FCF (13% over the last 10 years). The bulk of the CFO has gone in capex, which has also been the cause of rising Debt over the last few years. SSGR of Nandan is negative, which is also the reason why their debt has increased over the year. This is a red flag as far as Nandan Denim Ltd is concerned and potentially a No-go for the stock. The only positive in this is that the additional capacity will start production in FY 17, which would increase cash flow for the company. Further, the management has reduced its D/E ratio over the last few years and wants to reduce it further (as mentioned in the Annual Report). Nandan Denim Ltd is increasing its sales, its receivables are increasing (nbr of dates), and this is coming along with rising Debt. This is not an ideal situation, as the company will find it difficult to pay off its debt. 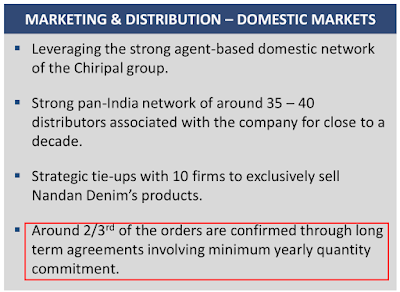 This is surprising as Nandan Denim Ltd has long-term tie-up with customers for 2/3rd of its orders with minimum yearly TO commitment. Further, there is a capacity increase taking place and they will need customers for that too. Trade payables have gone up too – from 68 cr to 75 cr in the FY16. Nandan Denim Ltd has a higher profitability compared to the other main competition e.g. Arvind. 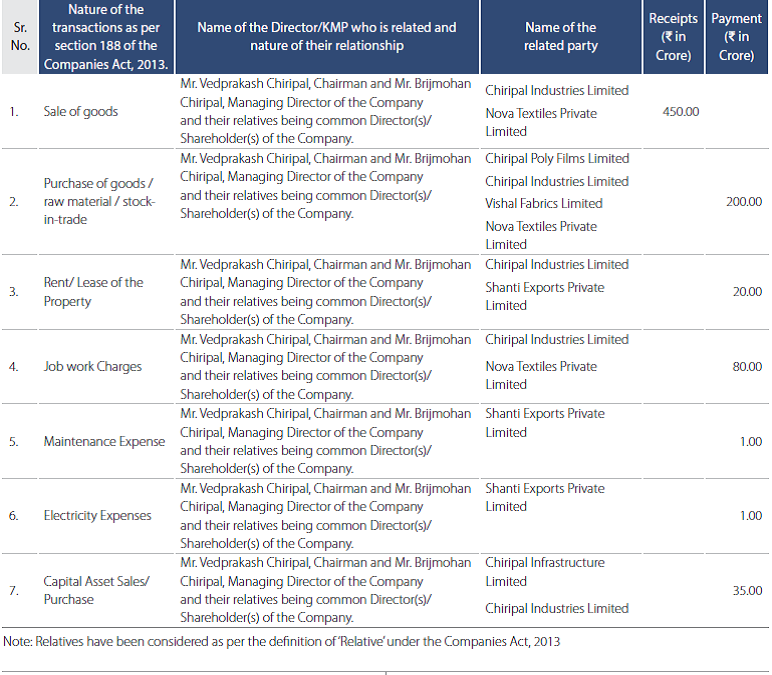 Further, Arvind’s market cap/ sales ratio is 1.6, whereas Nandan’s is just 0.5. With a PE reasonable PE ratio of 10.5, we may look at a stock growth going forward. EPS of Nandan Denim Ltd is higher than Arvind as well. The stock could grow if the company pays its Debt in the coming year, and does not go in for any more capacity expansions in the coming years. Nandan Denim Ltd has an extensive industry experience, a wide distribution network, and led by promoters who have an extensive industry experience. This, however, comes with some industry risks – high capacity of the Indian players, cyclical demand, and raw material price fluctuations. The excess capacity could lead to a decline in profit margins. However, so far the company has managed to grow the margins despite this. Nandan Denim Ltd lacks in having premium offerings compared to its competitors like Arvind and Mafatlal. It focuses on the low-mid segment, where the realization is lower as compared to the premium segment. Not only does the lower segment offer lower realization, the offerings in that segment is commoditized. Nandan Denim Ltd’s investor presentation shows that their shirting revenue contribution has declined in FY16 vs. FY15. the current P/E ratio is 10.5, which is quite low and within limits. The PEG ratio should be 35 given that Nandan Denim Ltd is growing at 35% CAGR in the last 5 years. PEG ratio is 10/35 = 0.28, which is significantly lower than 1, and hence it can be said that the company is quite undervalued. is 1/PE ratio, which would come to 1/10.5 = 9.5%. Today’s G-Sec rate is 6.9%, and this offers a MOS of 2.6% (9.5%-6.9%). This offers quite a good MOS for Nandan Denim Ltd.
P/B ratio for Nandan Denim Ltd is 1.91, which is less than the desired value of 2.0. This also means that PE*PB ratio for Nandan Denim Ltd comes to = 1.91*10.5 = 20.05, again lower than the desired value of 22.5. This again means that Nandan Denim Ltd is available at good valuations. DY of Nandan Denim Ltd stands at 1.27%, which is lower than 2%. However, it can still be considered as a good yield as it is still above 1. The promoters have entered into a related party translations, where they have sold goods of 450 cr to other related companies, while it has paid 370 cr through goods purchased, expenses and capital asset sales. While I cannot determine the nature of these transactions. Crisil, in its FY14 credit report too, has pointed out about these transactions and has also suggested that going forward these transactions need to be reduced. Nandan Denim Ltd issued 50,00,000 convertible warrants to foreign portfolio investments on 9th Nov 15, for Rs. 200. 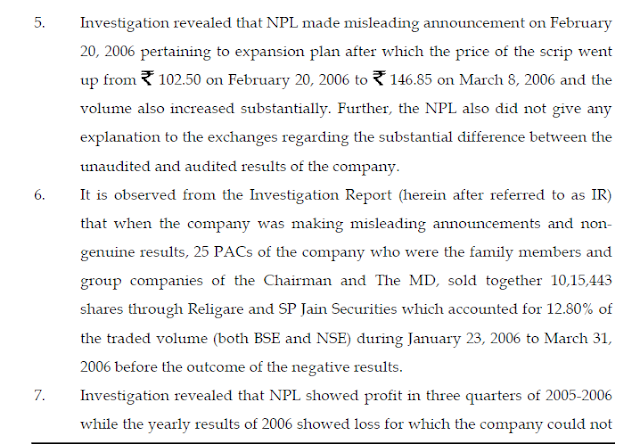 The share price of Nandan Denim Ltd was Rs. 120 when the warrants were issued. Given today’s share price, these look quite reasonable. 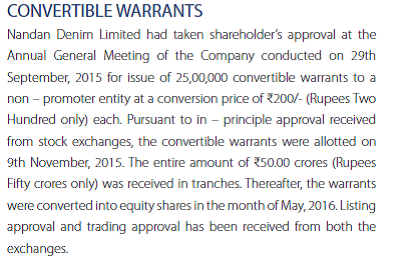 These warrants were converted into equity shares on 9th Nov 2015, at the price of Rs. 200. The share price of Rs. 200 looks fair in isolation, however, if we evaluate this closely evaluate this it comes to about 10% of the equity. If these FII’s had to buy 10% from the market, the stock price of the company would have gone up much beyond Rs. 200. Further, the promoters offloaded their share at Rs. 200, while the poor small investors will have to sell their shares at Rs. 134 (current price). The promoter shareholding reduced a bit in FY14, however they brought it back to 61% in FY 16. In FY 17 however, the promoter share has reduced back to 58% in FY 17. About 74% of the promoter shares were pledged in FY 12-13, which has come down to 4% in FY 17. This shows the interest of promoters in the business. The salary of the MD is 67 Lacs, which looks quite reasonable. Remuneration of the other directors (non-family members) is also within range, which is 11 Lacs per annum. However, Nandan Denim Ltd has paid 30crs in dividends with promoters holding 60% of the shares (18crs) despite having such a high debt! 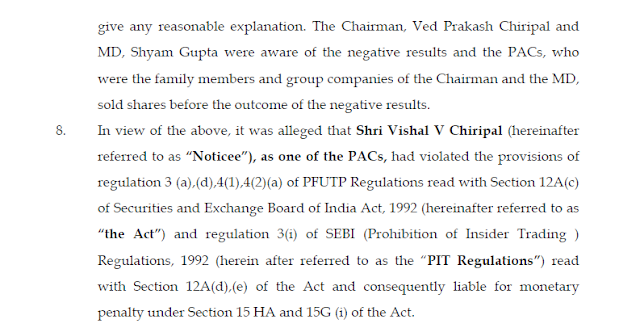 Please study this report, which states that SEBI held the MD of the company Mr. Ved Prakash Chiripal accountable way back in 2005-2006. They were accused of making misleading announcements, wherein there were differences between the audited and unaudited results. However, the issue was not established later. In a separate case, they have also been charged for running an institute that gives out bogus BBA degrees. There are multiple positives going in for Nandan Denim Ltd – increasing sales, improving margins and PAT, strong customer base, backward integration (which will further increase margins), and reducing Debt. Further, if one compared Nandan Denim Ltd to other peers its market capitalization is much lower and there is a scope for this to increase. 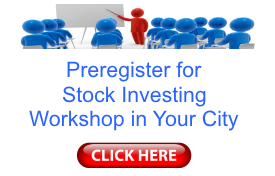 The stock is trading at a reasonable PE ratio of 10.5. However, this growth is largely funded by debt. While the D/E ratio has improved compared to FY13, it’s still quite high. The receivables and receivable days have increased substantially over the last few years – this will limit to pay their suppliers too. Promoters have offloaded their 10% share in terms of warrants to FII @Rs. 200, however small share price for small shareholders is still @Rs. 134, which is not favorable for the small shareholders. Further, the management, led by Mr. VP Chiripal has been accused of many frauds related to the Nandan Denim Ltd or other entities. Given these, I would recommend NO-GO for Nandan Denim Ltd. Thanks for sharing the analysis of Nandan Denim Ltd with us! We appreciate the hard work put in by you in the analysis. The effort put in by you in the analysis is visible by way of references to different public documents and analysis of peers to bring our key aspects of Nandan Denim Ltd and its management. Your report of Nandan Denim Ltd would prove helpful to any investor trying to understand it as a business and an investment opportunity. Let us analyse the performance of Nandan Denim Ltd over last 10 years (FY2007-16). Nandan Denim Ltd has been growing its sales since last 10 years (FY2007-16) at a brisk pace of about 18-20% year on year. It has witnessed its sales revenue grow from ₹222 cr. in FY2007 to ₹1,157 cr. in FY2016, which has further grown to ₹1,220 cr. in the FY2017. As per the data shared by Nandan Denim Ltd, it has achieved this growth by both unit price increase as well as by selling a higher volume of denim cloth. As per the May 2017 presentation of Nandan Denim Ltd, the realization of the company per meter of denim cloth has increased from ₹111.7 per meter in FY2013 to ₹131.6 per meter in FY2017. Over last 10 years, the denim manufacturing capacity of Nandan Denim Ltd has increased from 32 million meters per annum (MMPA) in FY2007 to 110 MMPA in FY2017. The management plans to achieve the future growth in its revenue by realizing higher realization per meter of denim cloth as well as selling a higher volume of denim cloth by optimally utilizing the newly installed capacity of denim manufacturing. As per the management of Nandan Denim Ltd, it plans to increase the realization per meter of denim cloth by making denim, which is more aligned to latest fashion trends (value added products) and focusing more on exports business. It remains to be seen whether the management of Nandan Denim Ltd is able to achieve these targets in future. An investor should keep a close watch on the realization levels of denim per meter achieved by Nandan Denim Ltd in future. An investor would notice that the above-mentioned sales growth has been achieved by Nandan Denim Ltd by improving its profitability margins. 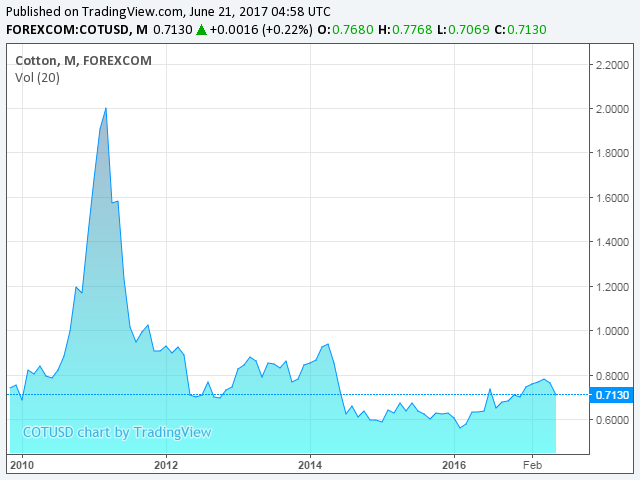 The above chart shows that the cotton prices in globally have witnessed steep decline from the highs of FY2011 to current levels of FY2017. 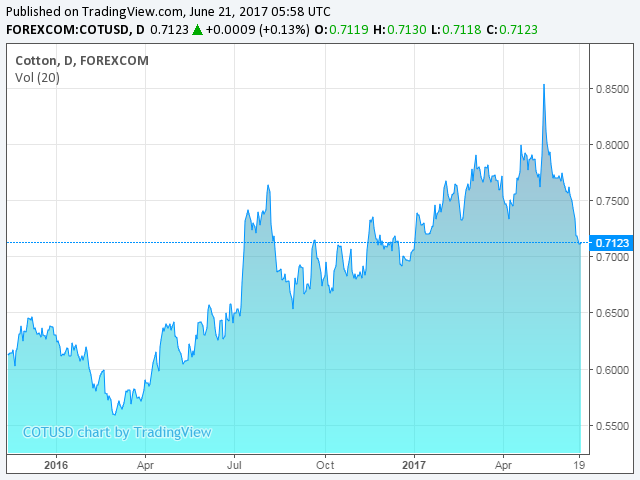 The above chart despite representing global cotton prices seems to work well to indicate the input costs of Indian manufacturers as well because the Indian cotton market seems to be globally integrated without any import restriction put in by the Government of India. There is no wonder that the raw material costs of Nandan Denim Ltd have declined from 78% of sales in FY2011, when the cotton prices were at the peak to 68% in FY2016 when the cotton prices have reduced substantially. Moreover, apart from the reduced cotton prices, the efforts done by Nandan Denim Ltd to achieve backward integration by expanding the in-house manufacturing capacity of yarn to reduce the cost of yarn seem to have also contributed to reducing raw material costs and thereby improving operating profitability margins. The in-house yarn manufacturing provides more control on the quality of the yarn production. 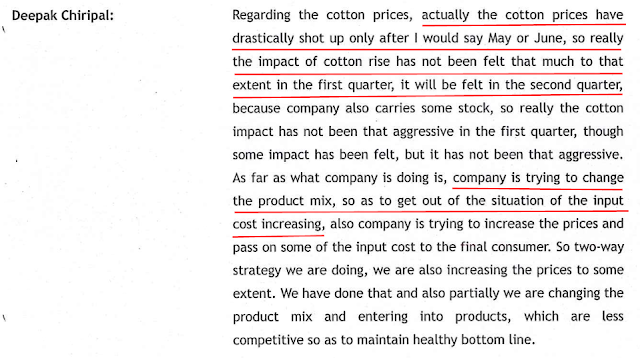 As a result, with increasing utilization of in-house produced yarn, the cost of yarn being used in denim production seems to have reduced over the years, which is another factor leading to improvement of operating profitability margins of Nandan Denim Ltd.
Again in the conference call on May 31, 2016, the company reiterated the same stance about the cotton prices being a pass through. Nandan Denim Ltd acknowledged that the cotton prices increase will hit its margins in next quarters. The cotton prices kept on increasing until May 2017 and we noticed that the operating margin of Nandan Denim Ltd declined to 15.6% in FY2017 despite continuous increase in the in-house yarn production. 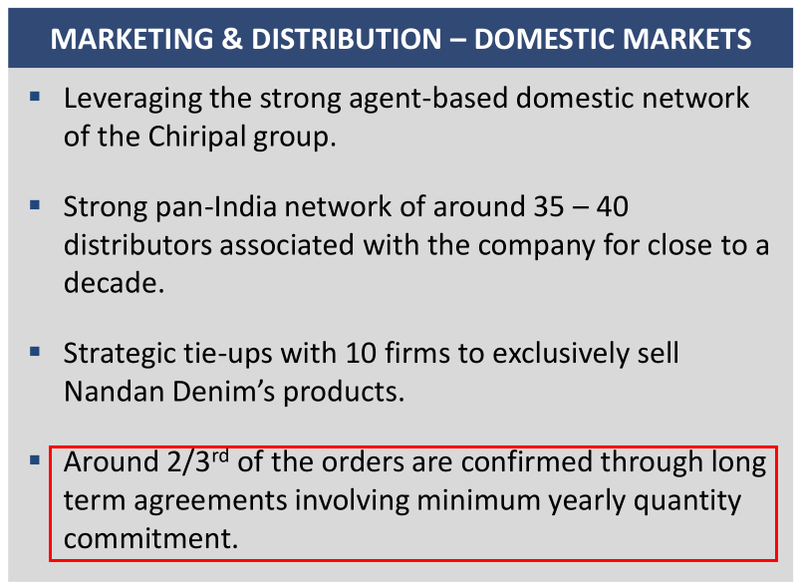 As per the management (Feb 2016 conference call), the composition of value added denim product in its overall denim revenue is about 10%, which means that most of the denim (about 90%) produced by Nandan Denim Ltd is the commodity product. Moreover, as communicated by the company, a denim product, which is value added today remain so only for a few months before the competing manufacturers replicate the same product and it becomes a commodity product. Therefore, it seems that for a denim manufacturer to promptly keep passing on the cotton price hikes to its customers, it needs to be very innovative and keep on introducing new denim variants in the market in quick succession so that the customer are willing to pay a premium pricing for its products and in turn the manufacturer can enjoy good margins. Going ahead, an investor should keep a close watch on the operating profitability margins of Nandan Denim Ltd to assess the impact of increased in-house yarn manufacturing capacity commissioned in FY2017 and to assess whether the company is able to continuously produce value added products in the market. The net profitability margins (NPM) of Nandan Denim Ltd have tracked the trend of operating profitability margins and as a result, NPM has improved from net losses in FY2009 to 5% in FY2016. The tax payouts of Nandan Denim Ltd over the years are less than the standard corporate tax rate applicable to companies in India. It might be due to the tax incentives available to the company in light of textile being one of the focus areas of central and state governments. However, it is advised that the investor seek clarification from the company about the tax incentives available to the company or any other factors, which are leading to lower tax payout ratios. An investor would notice that over the years the net fixed asset turnover (NFAT) of Nandan Denim Ltd has been improving. NFAT has improved from the low of 1.54 in FY2009 and has increased to 2.52 in FY2016. An investor would notice that the NFAT has been increasing during a period in which Nandan Denim Ltd has done substantial capital expenditure to increase the manufacturing capacity. The rise in NFAT during periods of high capex is possible when the companies quickly make a new capacity functional and then reach optimal utilization levels in a very short time. Otherwise, we notice that companies usually take about 1-2 years to reach optimal capacity utilization once the new manufacturing capacities are commissioned. Therefore, most of the times, investors notice that the NFAT initially witnesses a decline when a company does the capex and then the NFAT gradually rises when the new capacities get commissioned and their utilization reaches optimal levels. 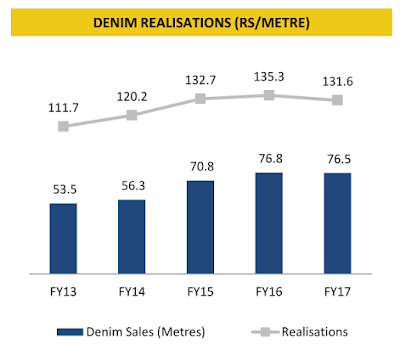 While analysing the information presented by Nandan Denim Ltd in various communications to stakeholders, an investor comes across a few important aspects, which might have a bearing on the pattern of increasing NFAT achieved by Nandan Denim Ltd during the periods of high capital expenditure. A look at the year-wise capacity levels of Nandan Denim Ltd indicates that the company has increased its manufacturing capacity in phases, where it completed initial phases of expansion and started production in these phases and simultaneously worked on additional phases of capacity expansion. Using the phase-wise expansion strategy seems to have led to better utilization of the incurred capital expenditure as compared to the situation where a company embarks upon a large capex and waits for starting production until the entire new planned capacity is complete and functional. As per the conference call in February 2016, Nandan Denim Ltd communicated to stakeholders that when it realized that the denim segment is witnessing better demand than the shirting segment, then it used part of the newly installed shirting facility to manufacture denim. This seems a good strategy by Nandan Denim Ltd to optimally utilize the available manufacturing capacity. It might also be one of the reasons, which has led to increasing net fixed asset turnover during the period when the company has been incurring large capital expenditure. As per the information shared by Nandan Denim Ltd, it has achieved a capacity utilization of 84% in FY2017 on the total installed capacity of 110 MMPA of denim manufacturing. As per the communication from the company to its stakeholders in May 2016 conference call, 84-85% is the maximum capacity utilization level, which can be achieved in a denim manufacturing plant and if a company has to grow beyond then it would need to install additional capacities. An investor would note that Nandan Denim Ltd had 99 MMPA of installed and functional capacity at the end of FY2016 and the additional capacity of 11 MMPA was commissioned in the December 2016 quarter. 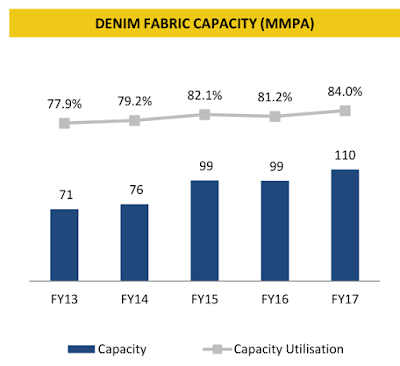 Therefore, the reported data achieving 84% capacity utilization level on the overall installed and functional capacity of 110 MMPA, seems to be a good performance by Nandan Denim Ltd as it indicates that manufacturing facility, which was commissioned in the Dec-2016 quarter also achieved the optimal capacity utilization at the end of FY2017. Nandan Denim Ltd had a lot of latent demand for its products and as a result, it could optimally utilize the newly installed capacities within a short period and thereby could achieve improvement in the net fixed asset turnover (NFAT) during the periods in which it has incurred large capital expenditure. At the end of FY2017, the entire installed denim capacity is almost optimally utilized and therefore, Nandan Denim Ltd has achieved the near maximum volumes of denim production, which it could by commissioning the new denim manufacturing capacity at March 31, 2017. Therefore, any further revenue growth for Nandan Denim Ltd would be possible only after it immediately starts another capital expenditure program. In light of the above analysis, we suggest that an investor takes the clarification from the company whether the data of capacity utilization of 84% level of the entire commissioned denim manufacturing capacity of 110 MMPA at the end of FY2017 is right? If the reported utilization level is for entire 110 MMPA, then whether by any means, Nandan Denim Ltd would be able to achieve higher capacity utilization levels than 84% in its plants to meet the volume growth requirement in coming future so that it can grow its sales? However, if by any possibility, the data on capacity utilization shared in the presentation reflects only the utilization levels of previously commissioned capacity of 99 MMPA, then there seem to be a scope of additional denim volumes being produced from newly commissioned facilities of December 2016 quarter and in turn achieve revenue growth in future. 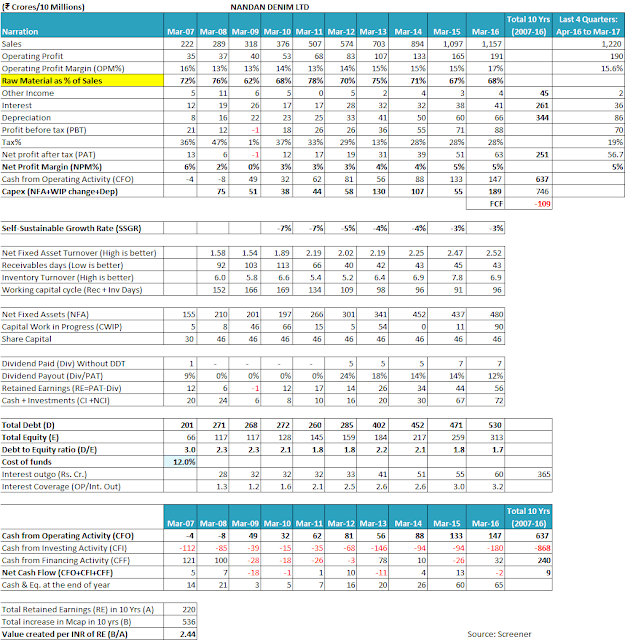 The above analysis seems to indicate that the recent large capacity expansion achieved by Nandan Denim Ltd by raising a significant amount of debt, does not seem to show visibility of volume growth for long-term future as the capacities are already nearing optimal capacity utilization. In light of this observation, it does not look surprising to an investor that Nandan Denim Ltd has now resorted to equity dilution by way of issuing convertible warrants to foreign portfolio investors (FPIs) so that it may reduce its leverage and meet the cash requirements to fund another round of capacity expansion, which it might need to commence to achieve volumes growth in future. We would discuss more about high funds requirements to achieve revenue growth by Nandan Denim Ltd in more detail in later part of this article. Let us now look at the performance of Nandan Denim Ltd on other parameters of operating efficiency. The company has managed to reduce its receivables days from the high of 113 days in FY2010 to 43 days in FY2016. This is a significant improvement in the credit terms being offered by the company to its customers and subsequent collection practices. The current receivables days seem to be in line with the usual practice of 45 days of credit period to domestic customers and further lower credit period for export orders backed by letters of credit (LC). The inventory levels seem to be managed efficiently by Nandan Denim Ltd as the inventory turnover ratio (ITR) has improved from 5.2 in FY2012 to 6.9 in FY2016. Overall, the ITR has been mostly consistent within the range of 6-7. It seems that as a result of efficient working capital management by the company, it has been able to reduce its working capital days (receivables days + inventory days) from 169 days in FY2010 to 96 days in FY2016. The investor would notice that Nandan Denim Ltd has a negative SSGR of about 3-4% over the years whereas it has been growing its sales revenue at a growth rate of 18-20% in over the years. Upon reading the SSGR article, an investor would appreciate that if a company attempts to grow at a sales growth rate, which is higher than the SSGR, which it can afford from its internal sources, then will have to rely on the funds infusion from outside in terms of debt or equity. The same has happened in the case of Nandan Denim Ltd.
As a result, Nandan Denim Ltd has witnessed its debt levels increase from ₹201 cr. in FY2007 to ₹530 cr. in FY2016. The debt has increased further in FY2017, however, we would get to know the exact level of debt at March 31, 2017, only when the annual report for FY2017 is published, which would provide the detailed notes to financial statements. 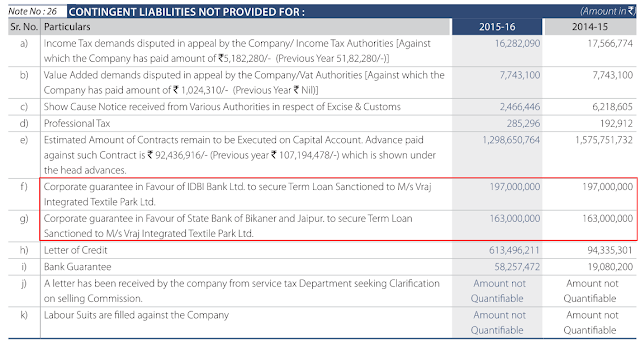 The detailed notes to financial statements are essential to know the complete debt levels of Nandan Denim Ltd as a part of debt known as current maturity of long-term debt (CMLTD) is shown as part of “other current liabilities” under the section “current liabilities”. The details of CMLTD are not provided by companies in the summary balance sheet, which is disclosed with September and March quarter results. This assessment of SSGR gets substantiated when the investor analyses the cash flow position of Nandan Denim Ltd.
Over FY2007-16, Nandan Denim Ltd has witnessed its sales increase from ₹222 cr. in FY2007 to ₹1,157 cr. in FY2016. For achieving this sales growth the company has done an additional capital expenditure (capex) of ₹746 cr. In addition, the company had an interest expense of ₹261 cr. over FY2007-16 to service the ever-present debt on its books. Therefore, Nandan Denim Ltd had to do meet a cash outflow of about ₹1,000 cr. to meet the capital requirements to expand its manufacturing capacities and achieve the 18-20% annual growth rate in last 10 years (FY2007-16). However, the investor would notice that Nandan Denim Ltd has generated a cash flow from operations (CFO) of ₹637 cr. over FY2007-16 resulting in a shortfall of about ₹370 cr, which has been met by the company by raising incremental debt of about ₹330 cr. over FY2007-16 (₹530 cr. – ₹201 cr.). SSGR and FCF are two of the main pillars of assessing the margin of safety in the business model of any company. Amit, we appreciate the excellent work done by you in tabulating the year-wise pledging data. The pledging of shares by promoters should be a cause for concern as many times, it is an indicator of tight liquidity situation being faced by the company. The shares might be pledged with lenders by promoters as part of additional security to lenders of Nandan Denim Ltd for the loans given by these lenders to the company. In such cases, the pledge gets released as the company repays the debt. The shares might be pledged by the promoters to raise funds in their personal capacity to meet their personal expenses or to fund their other capital commitments. In such cases, the minority investors carry the risk. This is because if the promoters are not able to repay their debt, then the lenders would sell the shares held by promoters in the market, which would lead to a decline in stock prices and the wealth of all the shareholders including retail minority shareholders will get eroded. Currently, the pledge levels are significantly reduced at March 31, 2017, when compared to previous years. However, we believe that the investors should be aware of the reasons for which the promoters have pledged up to 75-80% of their shareholding in the past. 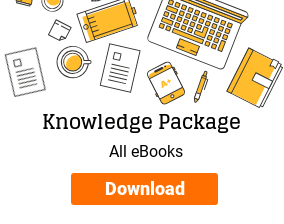 Trade payables represent the amount to be paid by a company to its suppliers/vendors. As per September 2016 quarterly results, Nandan Denim Ltd had trade payables of about ₹67 cr. at September 30, 2016, whereas at March 31, 2017, the trade payables increased to ₹135 cr., effectively indicating a shift of ₹70 cr. of cash from vendors to the company. Even though at the face of it, it might seem that increasing trade payables means that the company is able to extract better credit period from its suppliers and thereby fund its working capital at the cost of its suppliers/vendors. This, in turn, leads to lower financing costs to the company. However, it is common finding that vendors/suppliers are the first counterparties to whom payments are delayed in times of liquidity stress. Therefore, many times, increasing payable days is the first indication of developing stress in any company. Therefore, we believe that an investor should delve deeper into the assessment of trade payables. The continuous need of external capital (debt or additional equity) for sustaining the growth of Nandan Denim Ltd is evident from the fact that the newly added capacities for which the significantly debt funded capex has just been completed already seem to be running at optimal capacity. It indicates that there is low visibility of the newly installed capacities sufficing for the volume growth for long-term future as the data provided by the company shows that only marginal additional volumes can be generated in future from recently commissioned capacities. 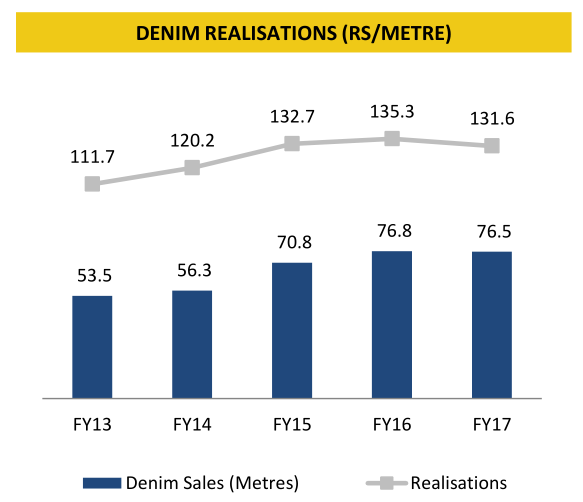 As discussed earlier, the Nandan Denim Ltd has to face its own challenges in achieving higher realizations per meter of denim, which is witnessed by declining realizations in denim. An investor would note that the decline in denim realization in FY2017 has come during a period when the cotton prices have increased during FY2017. 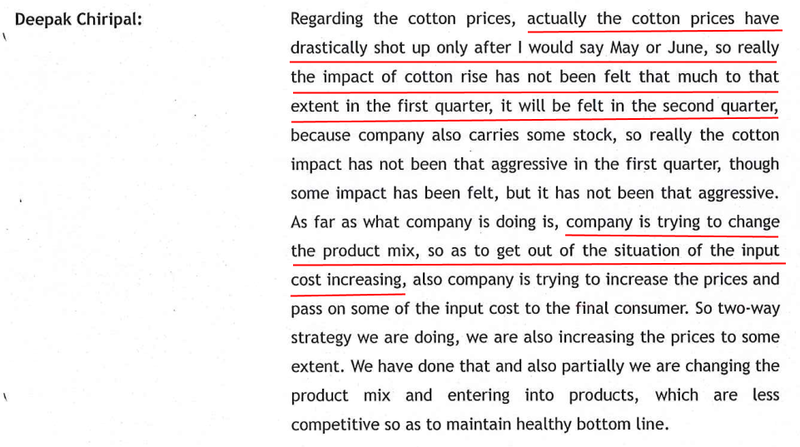 Therefore, it seems that the stated benefit of a pass through of increased cotton price to end customers is somehow not being realized by Nandan Denim Ltd. If Nandan Denim Ltd is not able to achieve higher volumes from currently available capacities (as these seem to have reached optimal utilization levels at March 31, 2017) and it finds it difficult to increase the realizations per meter of denim, then to grow in future, it would have to start another round of capacity expansion. However, an investor would notice that Nandan Denim Ltd has already leveraged itself significantly by funding the recently completed capex primarily with debt. Therefore, the company might find it difficult to raise additional debt in quick succession for a new round of capex. The company seems to realize that its leverage position is high and it might be one of the reasons for the company to raise additional equity from Polus Global Fund by way of convertible warrants, which got converted into equity shares in FY2017. This seems a step to reduce the leverage when measured in terms of debt to equity ratio. 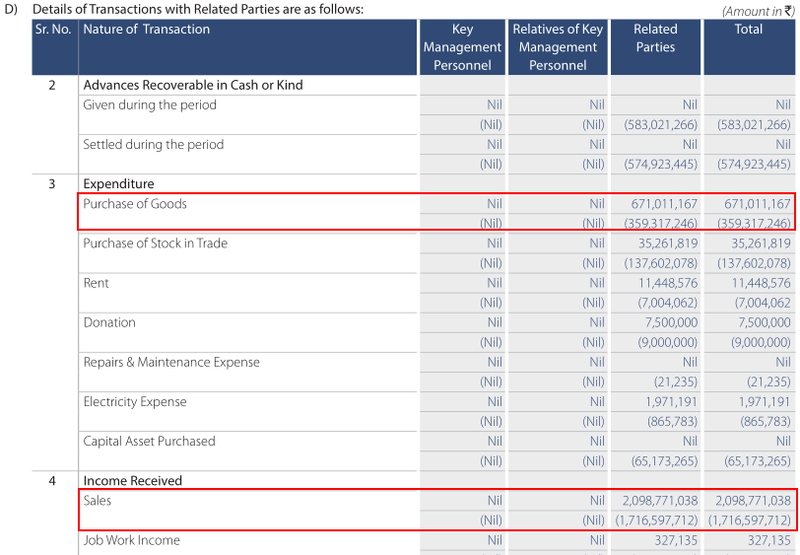 In case, Nandan Denim Ltd finds it difficult to raise additional debt to fund new capex to grow volumes of denim sales, then it would either have to wait until it repays the existing debt by using the cash generated from existing manufacturing capacities and let go of volume growth in the interim. Only then the lenders would feel comfortable taking any higher exposure on the company. Or the company would have to raise further equity to reduce its leverage as well as to meet funds requirement for any additional capacity addition. The recent talks to issue convertible warrants to FPIs might be a result of such developments. Running capital intensive businesses with low profitability margins is always tough. Many times, the growth in such businesses turns out to be cash guzzling, which such businesses are not able to meet from internal sources. Investors should be aware of the continuous need of additional capital by such businesses to achieve growth before making the final investment decision. Examples of two companies with low NFAT and low profitability, which fell into debt trap while chasing the non-profitable debt-funded capital intensive growth are Amtek India Ltd (Castex Technologies Ltd) and Ahmednagar Forgings Ltd (Metalyst Forgings Ltd). Investors should read these cases to understand the stress a capital intensive business with low NFAT can put on the balance sheet of the company if such a business is not associated with high profitability margins. It is advised that going ahead an investor should continuously monitor the debt levels and additional equity infusion into the company. Nandan Denim Ltd was initially a trading company and it started denim manufacturing facilities in FY2004 with a capacity of 6 MMPA. The management has shown good project execution skills since then and within next 13 years, the company has a commissioned denim manufacturing capacity of 110 MMPA, which is apparently largest in India and fourth largest in the world. Nandan Denim Ltd was incorporated by Mr. Vedprakash D. Chiripal and Mr. Brijmohan Chiripal in 1994. Currently, the next generation of the promoter family seems to be taking business responsibilities, which is evident by Mr. Deepak Chiripal taking over the responsibilities of CEO of the company. It remains to be seen whether the new generation of the promoters is able to contribute and grow the company to next phase and more importantly, whether they are able to convert the company into a source of free cash flow to shareholders. Such long terms agreements provide comfort to investors about the visibility of sales of the company. Nandan Denim Ltd has been receiving incentives from both central govt. as well as from the state govt. of Gujarat on the debt taken by it to funds its capex requirements. Such interest incentives are available for a Ltd number of years within which the debt needs to be repaid. If any company is not able to produce sufficient cash from operations to repay these loans on time and therefore may have to resort to the refinancing of the loans, then the new loans would not have the subsidized lower interest rate. Such new loans would be at market rate, which increases the interest burden on companies, which are not able to generate sufficient cash to repay the loans taken. Therefore, it is essential for an investor to keep a track of cash generation by Nandan Denim Ltd in future and monitor that the repayment of the loans is done within time and from internal resources. In November 2015, Nandan Denim Ltd issued warrants to Polus Global Fund at ₹200/- per share. Previously, the share price of the company had been continuously at lower levels than the allotment price. 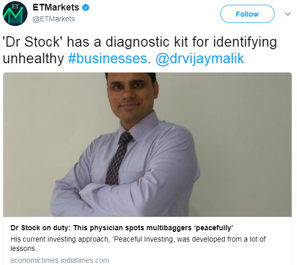 The share price has touched the levels of ₹100 for the first time in June 2015 and had reached the highest levels of ₹158-160 during August 2015. We believe that an investor should assess this aspect further as the allotment of warrants at a very high price is counter-intuitive for any investor, be it institutional or retail. As very high initial allotment price reduces the probability of future returns for the investors. Moreover, the new FPIs, as per the FY2016 annual report, are also willing to subscribe to warrants at the same valuation of ₹200 per share arrived in FY2015 despite significant changes in the company and its capex execution in the interim. Many times, if the related party transactions are not at market prices, then they offer an instance of taking away the economic benefits of business activities from the shareholders of the company to members of the promoters group. Therefore, it is advised that an investor should study these transactions further to assess whether these transactions are at market prices. 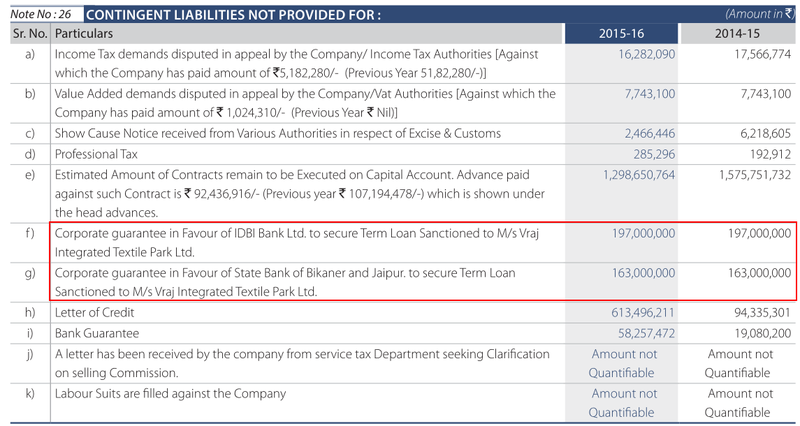 As per the contingent liabilities section of the FY2016 annual report, page: 130, Nandan Denim Ltd has given guarantees to different banks (₹19.7 cr. and ₹16.3 cr.) on behalf of loans taken by Vraj Integrated Textile Park Ltd.
A guarantee to the banks on behalf of other companies means that if the other company, who is the actual borrower, is not able to repay the loan taken by it, then Nandan Denim Ltd will have to repay the loan to the lender. This guarantee has the potential of increasing the debt obligations of Nandan Denim Ltd by about ₹36 cr. (amount of both corporate guarantees) over and above the loans taken by Nandan Denim Ltd of ₹530 cr. at March 31, 2016. Moreover, the non-current investments section of the FY2016 annual report of the company, page 122, states that Nandan Denim Ltd has invested ₹5.8 cr. in equity shares of Vraj Integrated Textile Park Ltd.
We believe that an investor should study the relationship of Nandan Denim Ltd and Vraj Integrated Textile Park Ltd further. The auditor in the FY2016 annual report of the company, page 130, has stated that the debtors are subject to confirmation. Investors understand that it might not be possible for the auditor to take confirmation from each of the debtors. However, it is expected that the auditor would take confirmation from at least key debtors i.e., for example, largest 10 debtors/a sample of debtors on a random basis. If the auditor has taken such confirmation on a sample of debtors, then it should be mentioned in the annual report. Non-confirmation from debtors raises the risk of the said receivables being under dispute where the company might claim that the customer is liable to pay but the customer might say that the goods were faulty or never received and therefore, it is not going to pay. 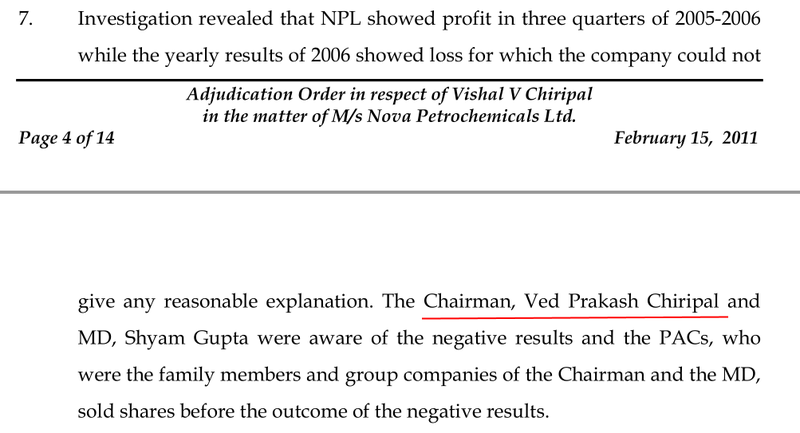 The case involved allegations that Nova Petrochemicals Ltd made a non-genuine announcement about its expansion plans and also gave misleading financial results to shareholders. It was alleged that these activities led to increase in share price of Nova Petrochemicals Ltd and the relatives of the promoters/management, then sold a significant stake in the company and got illegal benefit from it. SEBI’s order finally exonerated the person accused of benefiting from such sales: Mr. Vishal Chiripal on the ground that he had sold a major portion of his shareholding before the said non-genuine announcement about the expansion plans was made. 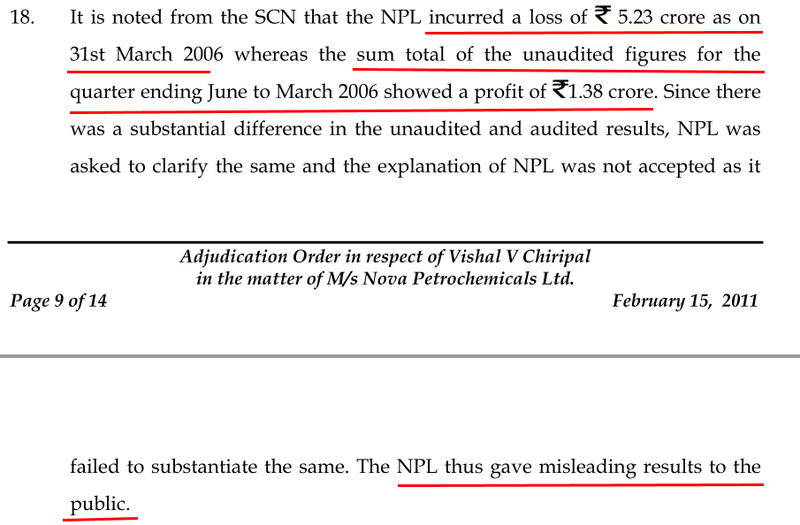 And that misleading financial results were published by Nova Petrochemicals Ltd where the sum total of all the quarterly financial results of the company showed profits but the final audited results of the company showed a loss. As per SEBI, the company was not able to give a satisfactory explanation for it. 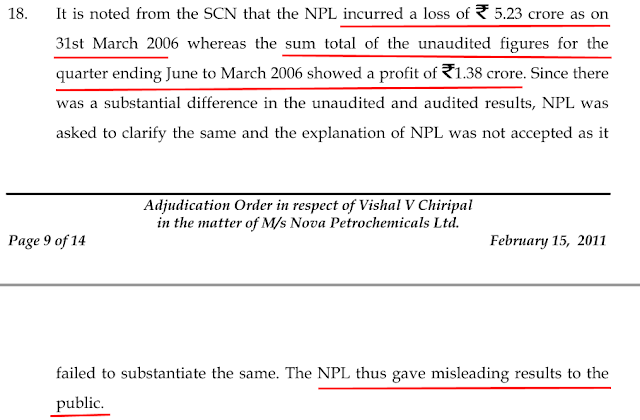 These two findings become significant for the investors while analysing Nandan Denim Ltd because the chairman of Nova Petrochemicals Ltd during the period under which these allegations are made by SEBI was Mr. Ved Prakash Chiripal who is also the current chairman of Nandan Denim Ltd.
We believe that an investor should be aware of this event while analysing Nandan Denim Ltd and therefore, thank Amit for bringing it to the notice of the author and the readers of our website. In the letter of offer for the rights issue by Nandan Denim Ltd (then named Nandan Exim Ltd) in Dec 2007, the company disclosed that one of its group company: Vishal Fabrics Private Ltd and its directors had been found guilty of violating rules of Companies Act related to maintaining books of accounts and have been fined by Additional Chief Metropolitan Magistrate, Ahmedabad in this regard. As per a news item in The Times of India dated December 9, 2016, a student has filed an FIR against the Shanti Business School and in response, three members of Chiripal family: Ved Prakash Chiripal, Brijmohan Chiripal and Vineeta Chiripal have approached Gujarat High Court for anticipatory bail. It is advised that an investor should follow up and find out the updates about the said case to know the truth behind the said allegations. As per the link shared by Amit from YouTube (click here), which contains a coverage of a news item from Gujarati news channel: Sandesh News, certain irregularities are alleged in a property being developed by Chiripal group. 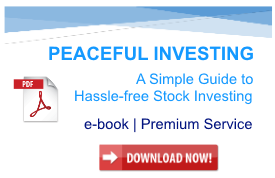 It is advised that an investor should look into this matter further to know the facts about the issue. 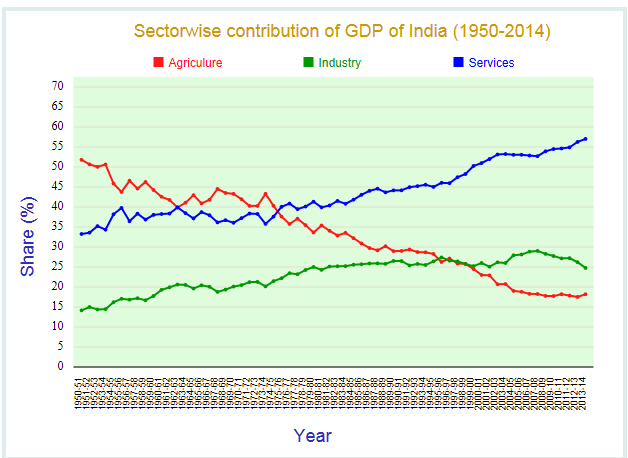 Whereas, agriculture lost the status of highest contributor to Indian GDP in late 1970’s and since then it is services sector, which is the highest contributor to Indian GDP. Currently, Nandan Denim Ltd is available at a price to earnings (P/E) ratio of about 11, which offers some margin of safety in the purchase price as described by Benjamin Graham in his book The Intelligent Investor. Overall, Nandan Denim Ltd seems to be a company, which has shown good sales growth over last decade, which is backed by demonstration of good project execution skills by the management as it has reached to the highest denim capacity in India and fourth highest capacity in the world of 110 MMPA within 13 years of starting denim manufacturing in 2007 with a capacity 6 MMPA. 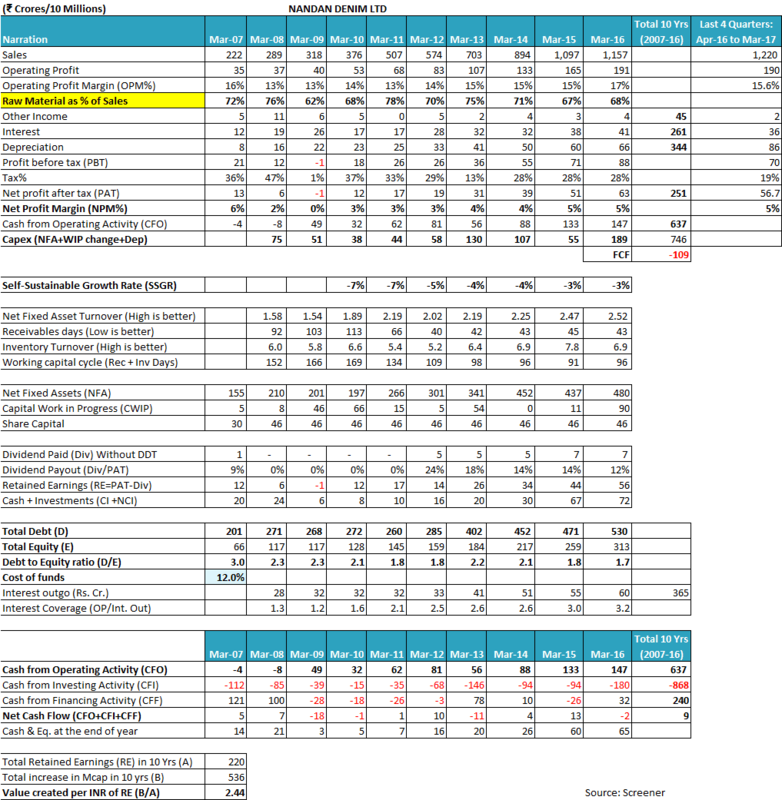 The sales growth of Nandan Denim Ltd has been associated with improving profitability, which seems to be result of mixed impact of declining cotton prices over last 5-6 years and the backward integration of operations by the company. Nandan Denim Ltd primarily operates in the commodity section of denim cloth as the value added product constitutes only about 10% of overall sales. As a result, the company has found it difficult to pass on increases in the inputs cotton costs in FY2017 to customer, which seems to have led to decline in the denim realization per meter in FY2017. Nandan Denim Ltd has stated its strategy to focus more on value added products and exports to improve the denim realizations and the profitability, however, whether the company is able to successfully achieve the same, remains to be seen. Nandan Denim Ltd operates in a capital intensive business and as a result, the growth of the company requires significant investments in the plant and machinery. The company has invested funds exceeding the cash generation from operations over past decade and as a result, it has witnessed its debt levels rise significantly along with equity dilution by way of issuance of shares to Polus Global Fund in 2016. The capital intensive nature of business operations of the company is evident from the assessment of Self-Sustainable Growth Rate (SSGR) and free cash flow (FCF) analysis of the company, both of which show negative values in their outcomes. In light of the above analysis, it is advised that an investor should monitor the debt levels and the leverage position of the company closely. Currently, Nandan Denim Ltd does not seem to have any operating leverage benefit left as according to the data presented by the company in May 2017 presentation, the company’s plants are running at 84% capacity utilization levels. As per the company management, denim manufacturing units operate at best at about 85% capacity utilization levels. Therefore, it seems that it the company plans to grow its sales volumes beyond FY2017 levels, then it might have to start a new phase of capacity expansion. Looking at the current high leverage levels, the company seems to be looking at raising equity by way to convertible warrants to another set of Foreign Portfolio Investors (FPIs), which though would reduce the debt to equity ratio, but would dilute the stake of existing shareholders. The management seems to have put in a succession plan in place. However, there are some instances about the management group’s actions in terms of related party transactions and other events of the past related to some of the group companies, which have come under the scanner of media and law enforcement agencies. It is advised that an investor analyse these issues in detail before they make final opinion about the company and its management. These are our views about Nandan Denim Ltd. 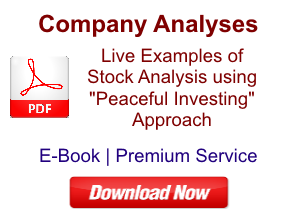 However, you should do your own analysis before taking any investment related decision about Nandan Denim Ltd.